How Should You Review Home Relocation Estimates? There is nothing as exciting for a homeowner as moving to a new dream home. At this instance, life couldn’t be more thrilling and fun filled. However, the problem is that all belongings in the old home need to be moved into the new location. This is not something a homeowner wants to do on his own. Hiring movers is something that is well worth the cost where moving homes is concerned. Unfortunately, picking the right movers can be problematic. There are way too many movers in a given area, and that all come promising the best of the services. But with a little preparation, it can be a little bit easier to choose an appropriate one for the task at hand. Let’s look at some of the tips on how to get you started. Talking to a trustworthy friend or family member who has recently moved is best way to get to know the movers around a neighborhood. Consult with them to see how the mover they selected performed before settling on them. If consulting your friends or family members isn’t a viable option, then do your own homework. The internet is a good source of information where selection of the movers is concerned. With the help of the reviews from the previous customers, you can be able to gauge the work of a potential mover anywhere around the country. If you see a lot of negative reviews on a moving company you are interested in, simply move on to the next. After having done your homework, check with Better Business Bureau to see whether the company you are looking at has had any complaints in the last 5 years or so. If they have a low grade with the bureau, or has quite a number of complaints, then it is recommended that you move on to the next. If a client made a complaint with the bureau, then it is likely that he was very unhappy with the mover. This is not something that often happens. To be on the safe grounds, simply move on as you really don’t want to deal with this kind of a mover. Having done your homework, it is now time to get a few estimates from a number of potential movers. While at this, make sure to get at least four estimates from different movers. Ensure that the selected potential movers come to your home personally to give you the estimates as it never works when this is done online. If a particular potential mover refuses to come to your home to give the needed moving estimates, then it is recommended to not bother wasting time with him. This kind of a moving service provider is up to no good and is probably trying to scam you out of money. Once you have had at least four estimates from different movers, then it is time to thoroughly scrutinize them. Among these, you will get an estimate that is slightly lower than the others. With this, you will probably think it is too good to be true, and in most of the cases, it is. Do not look at this kind of a quote as a chance to save yourself hundreds of dollars; look at it as a red flag. Why else would a moving company have such a low quote if they are not trying to scam the clients? This is problematic in a number of ways. 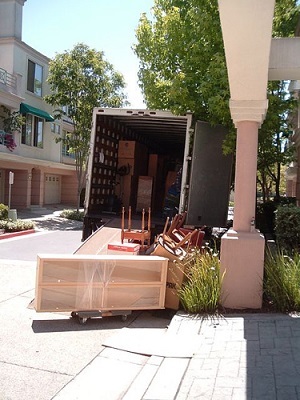 If you are moving locally, then most of the movers will give you an hourly rate. If any of them gives you a rate that is too low, then chances are that they don’t pay their staff well or their employees are grossly inexperienced. This can be a huge problem for you. Remember you are paying to have your possessions professionally moved. If four inexperienced movers show up at your place in a pickup truck and a horse trailer to move all your belongings within an hour’s time, then chance are you will end up with all kinds of issues, including broken furniture, poorly packed items, wasted time, and many more. Also if you are offered an hourly rate that is comparable to the others, but with lower estimated number of hours than the rest, then chances are that the mover is being dishonest. If they are honest with you from the beginning, then why would they want to move all your possessions in lesser time than what the others are quoting? If this happens, trust me, you will have all kinds of issues at the end of your move. Like earlier said, the lowest or the most expensive moving estimates are not necessarily the best option. Choose the best moving estimates depending on your personal preferences and requirements. All in all, choosing the most applicable estimates or even picking the movers is not always the easiest thing to do when moving houses or locations. But if you take a few precautionary steps such as thoroughly scrutinizing the offered quotes, then it is possible to get a good mover or moving estimates to suit your requirements. ←Is There A Proper Way To Pack Your Breakables When Moving Houses?